The island of Cyprus has a new sporting hero – and so does the University of Southampton! Ship Science student Pavlos Kontides became the first Cypriot ever to win an Olympic medal after his sterling silver performance in the men’s Laser class competition in Weymouth. Not only did the feat earn Pavlos a congratulatory call from Cyprus President Dimitris Christofias, he also received an invitation to the Presidential Palace. Celebrations also started in Southampton where Dr Dominic Hudson and his colleagues in the Faculty of Engineering and the Environment praised Pavlos for his maturity and dedication. “All of us in Ship Science would like to congratulate Pavlos on his exceptional achievement in winning the silver medal in the Laser class at the Olympics,” said Dr Hudson, Senior Lecturer and Course Co-ordinator for the MEng in Ship Science. “He showed great maturity in suspending his studies after successful completion of the second year of his degree course in order to concentrate on training and competing in the run-up to the Olympics and we are all pleased that this hard work has paid-off in the best possible manner. “Ship Science is a small cohort of students, many of whom are keen sailors, so we are extremely proud to have an Olympic medallist from amongst our current students,” Dr Hudson continued. “We now look forward to welcoming Pavlos back to the University in October for the resumption of his degree course. “He is not just a good sailor – he is currently averaging marks in the First Class range across all subjects,” Dr Hudson concluded. From the moment he scored his first competitive win at the Laser Youth National Championship in 2003 at the age of 13, Pavlos has made an impact on the sailing world. In 2007 and 2008 he won back-to-back gold medals in the Volvo Youth Sailing ISAF World Championships in Canada and Denmark. In the Beijing Olympics four years ago, he placed 13th as the youngest sailor in the competition. Last year he placed 5th at the World Senior Championship on Hayling Island in the UK. 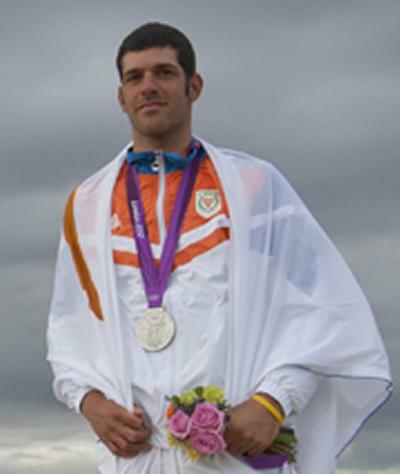 Despite injuries during the build-up to the Olympics, including a broken hand which forced him to wear a cast whilst training, Pavlos persisted in achieving his goal for 2012.